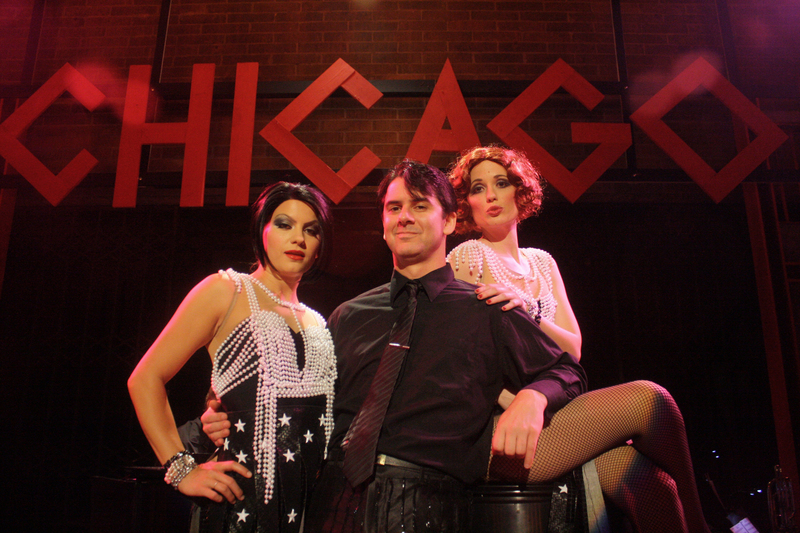 Revival-Survival: One More Productions’ Great “Chicago” Fires Up A Real Sizzling Time! “They said we‘d have the hottest show of the year,” joked Producer Damien Lorton through teary-eyes, “but we‘re OK, we’re here and the show MUST go on!” With literally just days until opening, a fire in Garden Grove’s landmark “Gem Theater” facilitated the need for a fast move of his company, “One More Production’s” presentation of Kander and Ebb‘s classic “Chicago” next door to the Festival Amphitheater. The blaze erupted in pre-dawn hours of Memorial day, in what investigators believe was the second story of the theatre. Although there were no injuries, the damage to the interior–specifically to the costume shop, green room and offices–remains considerable. 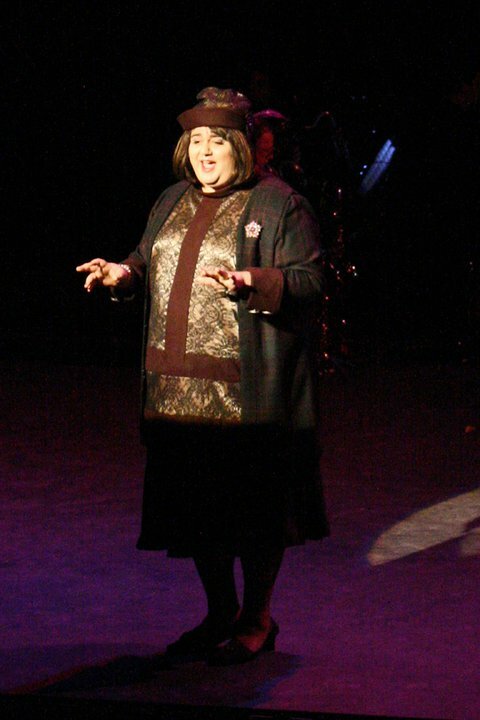 However, on opening night, Saturday June 4, Lorton addressed the crowd regarding the situation, and in the finest sense of that old theatrical tradition, not only did the show go on, it razzle-dazzled everyone in attendance. Fortunately, as directed by Lorton and choreographed by Shauna Bradford, this “Chicago” takes its cues from the 1996 Broadway revival, which emphasized a bare-bones, back-to-basic staging. Told in a revue-style format where the actual scene locations are merely suggested, the simplified set and minimal use of props doubtless has aided in the overall transition. Yet in the case of this “Chicago” the ‘heart’ on stage refers to way more than just the lead character’s name, and given the strength of the already solid cast, the overall production–including the 14 piece orchestra–hasn’t suffered. Presenting Those "Scintillating Sinners"-Nicole Casseo as "Velma Kelly", Johnny Fletcher as "Billy Flynn" & Gretchen Dawson as "Roxie Hart"
"The Name On Everybody's Lips Is Gonna Be...ROXIE!" Other stand-outs include Tim Klega’s Amos Hart–Roxie’s almost preternaturally gullible husband. Klegas’ take is more childlike than world-weary, making his second act moment in the spot light, “Mister Cellophane” more reminiscent of say, Lou Costello than Bert Williams–the legendary Vaudevillian and original ‘hard luck‘ comic who inspired it. In one comically poignant moment, while the supposedly ‘expecting’ Roxie, flanked by two chorus boys, sings “My Baby And Me”, Amos runs wildly in front of the stage rejoicing his upcoming paternity–completely oblivious to the fact that, were the news true, he would in no way be responsible! The real scene stealer here though, is D. Berlin who astounds in the role of “Mary Sunshine”, ‘sob sister’ from the Evening Star” newspaper. Not to give away surprises, but were there any, more than a few in the house were completely taken in by this supremely talented plus-sized “gal” who hits notes that are nothing short of phenomenal! There’s also fine integrity among the “Six Merry Murderess’s Of The Cook County Jail“. From Type-A hot head, to sweet-natured yenta, every one had a distinctive and widely varied personality, evidenced as they relate the stories of how each landed behind bars. 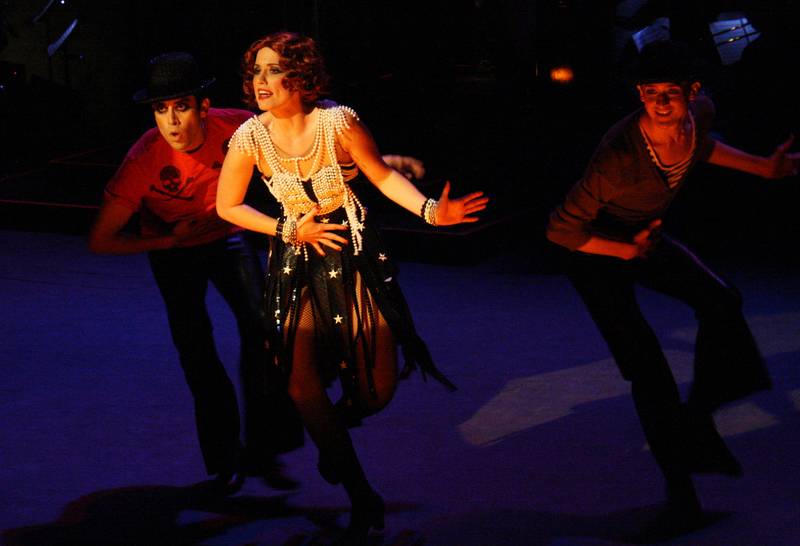 Such detail makes “The Cell Block Tango” far more than just your standard chorus routine. D. Berlin Shines As "Mary Sunshine"
Then again, perhaps the most crowd-pleasing numbers feature the entire ensemble, such as Roxie’s rousing press conference, “We Both Reached For The Gun” and the Second Act show stopper, “Razzle Dazzle”, during which Billy explains to his client that all the world is indeed a stage. Yet, where Lorton’s concept really shines is in emphasizing those elements marginalized in previous productions–particularly the “Academy Award-Winning” film. Additionally, another interesting twist has the Announcer’s part dispensed with in favor of each “act” being introduced by various cast-members already on stage. Thus, by extension, supporting characters like Fred Casely (Danny Diaz), Go-To-Hell Kitty (Scarlett Brais) and others, serve as commentators to what’s going on. "Look At Little Vel-See Her Give 'Em Hell. Ain't She Doin' Grand? She's Got 'Em Eating Out Of The Palm Of Her Hand!" 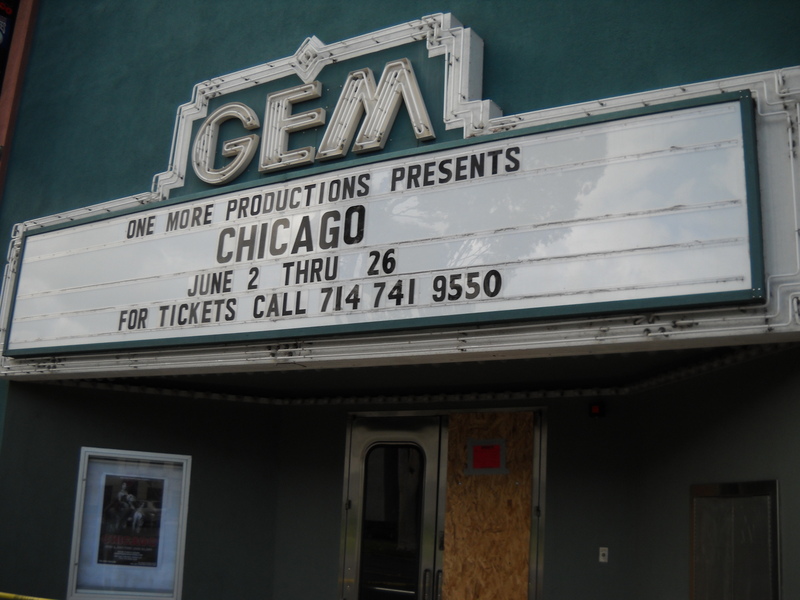 Considering that “Chicago” is played against the backdrop of old Vaudeville, it is sadly ironic that the GEM Theater, which dates back to the 1920’s, was itself once the area’s pre-eminent spot for Vaudeville entertainment. According to Lorton, the company will be out of the Gem for up to 46 months while the vintage playhouse is completely refurbished. He similarly acknowledges that this production could not have gone on were it not for the incredible last-minute assistance of other local organizations such as the Fullerton CLO and Fullerton College’s Theater Arts Department, beautifully demonstrating yet another less spoken tradition that states people in the artistic community look out for one another. What State's This "Chicago" In? Definitely NOT ILL! Production Photos courtesy of Chris Trela/ArtsPR. Special Thanks to Damien Lorton of “One More Productions”, Chris Trela of Arts PR and the cast, crew and musicians of One More Productions’ “Chicago” for making this story possible. 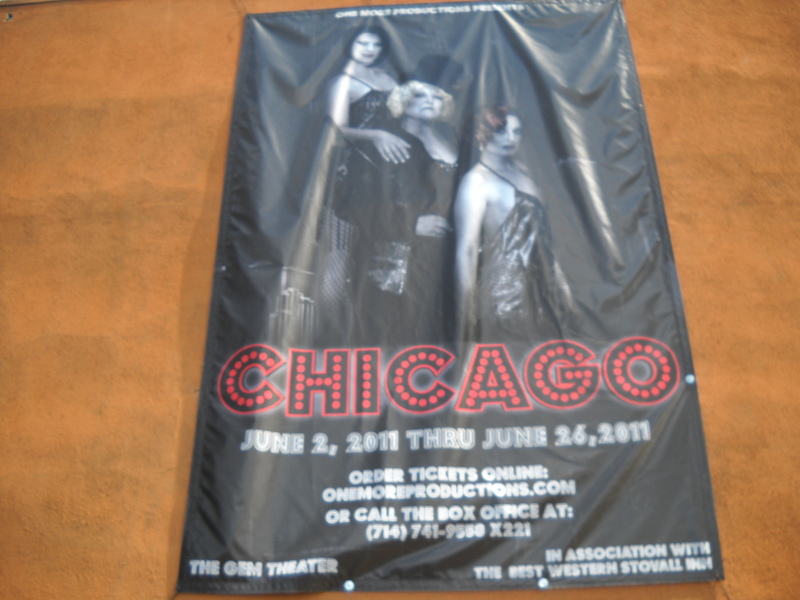 This entry was posted in Theater reviews and tagged All That Jazz, ArtsPR, Bob Fosse, Chicago the Musical, Festival Amphitheater, Garden Grove CA., Gem Theatre, Local Theater, Musical Revivals 2011, One More Productions, Orange County CA. Kander And Ebb, Razzle Dazzle, Theater Fire, Vaudeville. Bookmark the permalink.